Mill Valley's Shelterpoint Business Center occupies a narrow strip of asphalt between Richardson Bay and Highway 101, roughly five miles north of the Golden Gate Bridge. In the back of the office complex stands a tan building with floor-to-ceiling windows that offer sweeping views of Mt. Tamalpais' grassy southeastern slopes. This is the headquarters of SPO Partners, the North Bay's largest hedge fund. The serene sophistication of this setting belies the nature of SPO Partners' business. The $5.2 billion investment firm is among the country's leading financial backers of oil and natural gas fracking. Its web of financial connections tie it directly to the country's most controversial infrastructure project—the $3.7 billion, 1,134-mile Dakota Access Pipeline—and even Republican Party presidential candidate Donald Trump's economic policy team. SPO Partners is the largest investor in Oasis Petroleum of Houston, Texas, which controls more than 400,000 acres within the Bakken and Three Forks oil basins of North Dakota and Montana. Oasis is working to complete a 19-mile oil transmission system from its North Dakota petroleum handling facility to the Dakota Access Pipeline, thus positioning it to supply roughly one-ninth of the pipeline's estimated 470,000 barrels of daily crude oil deliveries, records with the North Dakota Public Service Commission show. The Dakota Access Pipeline originates in the Bakken oil patch and traverses North Dakota, South Dakota and Iowa, and ends in Illinois, linking to transmission routes to the East Coast and Gulf Coast. For several months, indigenous people, environmentalists and Great Plains residents have protested the project because it threatens water quality and myriad sacred sites of the Standing Rock Sioux. It will also contribute to the global climate crisis. "Certainly Oasis Petroleum's hedge fund investors will make a lot more money if the company can supply the Dakota Access Pipeline," says Antonia Juhasz, a San Francisco–based oil and energy analyst and author who has studied hedge funds and the North Dakota oil boom. Wall Street tycoon John Paulson, a key member of Donald Trump's economic policy council, is also a major investor in Oasis Petroleum. According to Oasis Petroleum's most recent financial filings, SPO Partners owns the largest share of the company, while Paulson's hedge fund owns the fourth largest. Trump himself has invested between $3 million and $15 million in Paulson's hedge funds, a 2015 federal campaign disclosure form reveals, raising the possibility that the Republican candidate is also an investor in Oasis Petroleum. 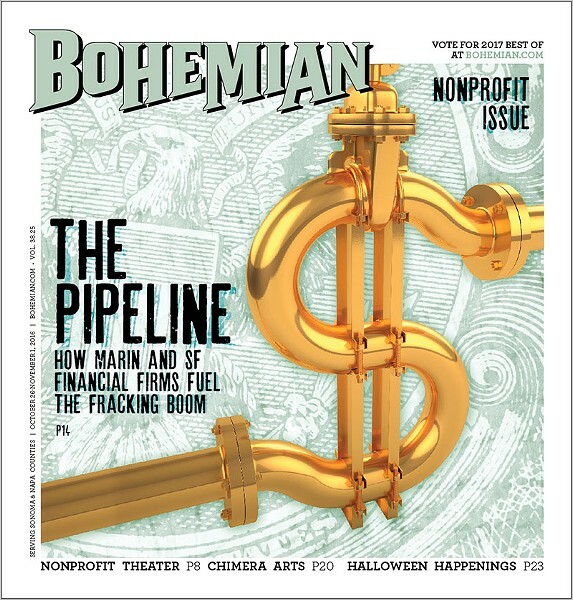 But the Mill Valley hedge fund's North Dakota oil investment is only one tributary to a river of investment capital flowing from the San Francisco Bay Area to the Dakota Access Pipeline and the associated fracking boom. These investors include other hedge and pension funds, as well as San Francisco–based Wells Fargo. The bank was the largest U.S.-based financier of oil and gas production and infrastructure as of 2014, according to a presentation given by Wells Fargo executive vice president Mike Johnson. A recent report from the nonprofit Food & Water Watch notes that 38 banks, Wells Fargo among them, have directly financed the controversial Dakota Access pipeline. The financial sector's stake in the project helps reveal "the tangle of interests" fueling the United States' ongoing dependence on fossil fuels, said Food & Water Watch senior researcher Hugh MacMillan, chief author of the report. "When you see the kinds of financial institutions backing the pipeline, it shows the power of the forces the tribes in North Dakota are going up against," he says. During the last decade, oil companies developed the ability to drill to depths of 5,000 to 10,000 feet before turning their bits sideways, cutting horizontal lines into previously inaccessible rock formations. By fracturing, or "fracking," deeply buried layers of hydrocarbon-rich shale formations, they force natural gas and oil to the surface. These techniques have revolutionized oil and gas production, yielding hundreds of billions of dollars in profits to investors. In 2014, the U.S. passed Saudi Arabia as the planet's biggest oil producer. It has surpassed Russia as the world's biggest producer of oil and gas combined. Two shale oil basins in particular have helped spur the production surge: the Eagle Ford in south Texas and the Bakken. Large financial institutions have actively cultivated the North American oil boom. A 2012 Citibank report called "Energy 2020: North America, the New Middle East" notes that "the economic consequences" of the oil and gas industry's "supply and demand revolution are potentially extraordinary," and touts that "infrastructure investments ease the transport bottlenecks in bringing supply to demand centers." It also sounds a cautionary note: "The only thing that can stop this is politics—environmentalists getting the upper hand over supply in the U.S., for instance; or First Nations impeding pipeline expansion in Canada." As with Canadian tar sands oil (see "Crude Awakening," June 8), the Bakken shale's Achilles' heel is that it is located in the middle of the continent, far away from shipping terminals and most oil refineries. That has led many North Dakota producers to transport crude oil by train, including to California refineries, a highly dangerous method given that Bakken oil is especially prone to lethal explosions. The Dakota Access Pipeline would improve North Dakota oil producers' ability to compete economically, notes North Dakota Petroleum Council communications director Tessa Sandstrom. It would also reduce deliveries by train, she says, making them safer and freeing up rail lines for farmers to bring their commodities to market. "This pipeline resolves issues that are big concerns among North Dakotans," Sandstrom says. "It's also a legal pipeline at this point, and we think it should go forward."